Thailand’s islands are a curious combination of heavily developed tourist hotspots and almost completely untouched landscapes. The great thing about the islands is that they’re all within easy reach of the mainland, and many of them interconnect with one another via local speedboats. Many holidaymakers explore them by ‘island hopping’ between several islands in as many days. The stunning Andaman Sea on the South East coast of Thailand provides crystal clear waters for diving and snorkelling, and a rich variety of sea life. There’s something for everyone on the islands here, whether you’re looking to explore diverse jungles, admire historic culture or simply relax and escape from the stresses of modern life. Thailand’s largest island, Phuket is an incredibly popular destination with holidaymakers, but that is not to say the entire island is one big holiday resort. The vast majority of tourists are concentrated around the beach resorts of Patong, Kata and Karon, all boasting pristine beaches and sparklingly clear waters. Since most of the overseas visitors spend their time on Phuket at these resorts, the rest of the island is mercifully tranquil and relatively untouched. Experience Thailand’s tropical jungle at Khao Sok National Park, where the lush foliage is home to elephants, lazy rivers and tree-house lodges. This area is said to be one of the oldest rainforests in the world. Be amazed by ancient plant species, magnificent cascading waterfalls and stunning limestone outcrops. In Phuket you can also immerse yourself in Thailand’s spiritual history when you visit Wat Chalong – the largest temple on the island. The colourful and elaborate building is decorated with innumerable statues and images of Buddha, as well as many other mythical and spiritual creatures. 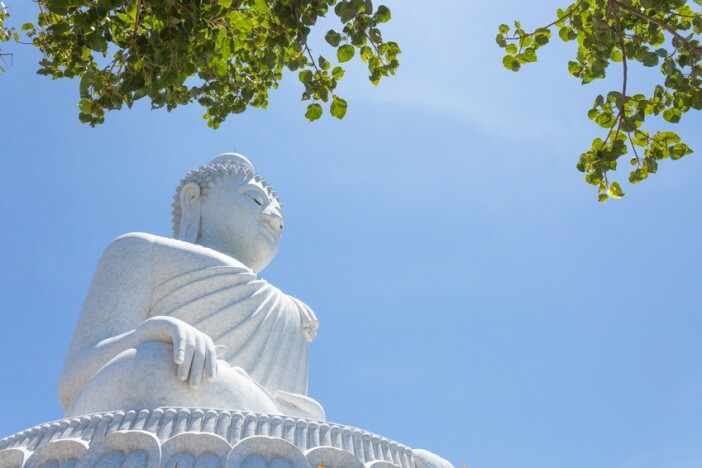 The Big Buddha is perhaps Phuket’s most iconic landmark, towering 45 meters high. A visit to the statue provides incredible panoramic views of the surrounding area as well as some great photo opportunities. Patong beach night market is a vibrant attack on the senses, with stalls selling anything from fresh fruits and local produce to cheap clothes and souvenirs. Vibrant neon signage and lanterns illuminate the scene as holidaymakers and locals wind their way through the throng. Possibly the most untouched of all Thailand’s islands, Ko Yao Yai is a relaxing haven just off the coast of Phuket. If you’re looking for a spot of tranquillity and a slower pace of life, this is the place to go. Relax on the beautiful beaches or snorkel in the clear waters. If you’re feeling adventurous, you won’t have to walk far to find local villages made with handcrafted wooden homes, as well as the local farmer’s coconut groves and rubber plantations. The lazy, relaxed atmosphere that pervades the whole island is intoxicating. A small coral island just a 45 minute speedboat ride from Phuket. With no roads or ATMs on the island, it’s the epitome of idyllic island life. Recline and relax on the white sands of Siam Bay, or spend the day diving or snorkelling at Lah Bay, where giant star fish, puffer fish and rainbow trout can be spotted in abundance. Ko Racha is a diver’s paradise, and it’s common to see tractors towing divers with their gear along the dirt tracks. The island’s population is primarily Muslim, and made up of farmers and fishermen. The island also caters to tourists with a variety of activities to enjoy, from horse-riding and mountain biking to fishing trips and nature hikes, but they don’t come cheap. The stunning 27-mile coastline of Koh Lanta attracts snorkelers and divers like moths to a flame. This Island is protected, and widely considered to have some of the best dive spots in Thailand. Popular dive spots include Hin Daeng, Hin Muang and Ko Haa. The island itself is relatively untouched, with incredible wildlife and stunning scenery. Dense mangrove forests, hidden lagoons and coastal caves will bring out the explorer in you. The island is relatively flat and has some good roads running the length of it, so exploring by moped or motorbike is the best way to take in as much of Ko Lanta as possible. Also known as Robinson Crusoe Island, Ko Hai is as deserted and idyllic as they come. The tiny island is just 4km long and 2km wide, covered by dense tropical forest and skirted by glorious white sands and calm, clear waters fringed with coral reefs. There are no indigenous people living on Ko Hai, and precious few hotels and resorts, making it ideal for a day trip to get away from the more hectic tourist resorts. Firmly cemented as one of Thailand’s travel hotspots, Koh Phi Phi is nonetheless beautiful despite the booming tourism. White sandy beaches, softly swaying palm trees and crystal clear waters skirt the island, while the vibrant main town of Tonsai Bay is a lively collection of bars, night clubs, restaurants and shops. Backpackers head to Koh Phi Phi for the party atmosphere, but there are plenty of more secluded areas that still retain their largely unspoilt beauty. If you want to visit the stunning Maya Bay, where the film The Beach was made, head to the cove in the early morning before the day trippers arrive. You might just have the place to yourself! Monkey Island is another favourite with holidaymakers, where you can meet the cheeky resident macaques, who love to paddle in the azure waters and will happily accept gifts of fruit from visitors. If you only have a limited time at Koh Phi Phi, take one of the many local boat tours around the coast of the island, which offer amazing views of the landscape and the chance to stop off at numerous hidden and secluded coves – ideal for a spot of snorkelling. While on the island, trek to ‘Viewpoint’ – a short but strenuous walk which rewards you with stunning views over the entire island and the surrounding turquoise seas. If you’re interested in taking a trip to Thailand, why not browse our full collection of cruises to Southeast Asia? With amazing prices on a wide range of cruises, you can afford to start planning your dream trip to Thailand. For more information, call our team on 1300 857 345.